An entrepreneur is born every day, and somewhere in the world right now someone has just commenced their eventful journey on the uneasy but ultimately rewarding path as an entrepreneur. But before the benefits start rolling in with sustained profitability, or even before the first client is secured and the first sales made, there are essential marketing processes you must establish as a budding CEO. These constitute the foundation for every new venture looking to survive the dynamic and competitive nature of today’s business environment and establish itself as a serious brand in its niche market. Here’s a sneak preview why deciding on the right, modern, and effective marketing strategy should be at the heart of your business planning. To use recent statistics from the U.K. startup scene, while 80 new businesses spring up every hour in 2016 (with the figure projected to grow even further this year), sadly 60 percent of these new businesses will become failed ventures within the next five years. Now, put side by side that ecstatic, almost indescribable feeling that comes with seeing your business plan and visions finally come alive in the form of a stable and vibrant enterprise and then watching it take a bad hit and tumble just a few years down the line due to harsh and unpredictable market forces. That outcome is more likely if you fail to put in place a solid marketing plan for your business to withstand whatever the market and the competition throws at it, to help the business expand, and in time become a leading brand in its industry. Yes, it’s a sad prognosis, but the reality is that the business world can be a jungle where only the fittest entrepreneurs can survive and steer their ventures away from the path to liquidation. Marketing—the processes for creating, communicating, delivering, and exchanging offerings that have value for customers, clients, partners, and society at large—is at the heart of business dynamics, particularly for startups that are still trying to build up a loyal customer base. 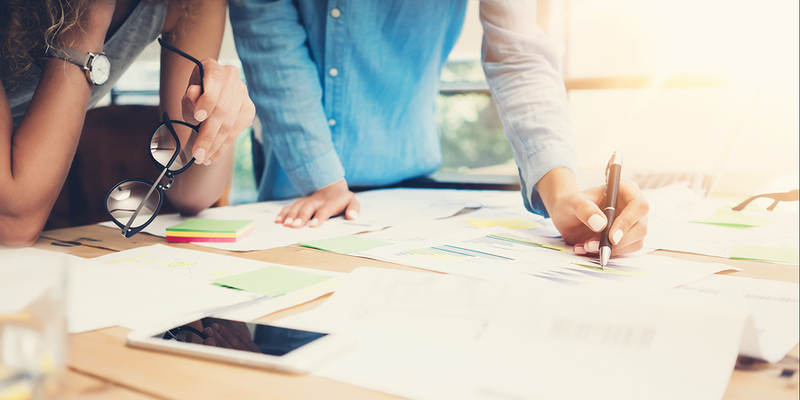 To lay the foundation of an effective marketing plan for your new business, you’ll need to carefully set out and implement certain proven marketing processes. These will guarantee your business the best chance of marketplace viability and eventually, with a little more hard work, emerge as a market leader. At the initial stages of your business life, when you think through your strategic business blueprint, a marketing plan must be a key component of your overall business plan. While some new business owners chose to take the uncertain approach of “cross the bridge when you get there,” in terms of planning, that is a highly unstable and ill-advised path that almost certainly takes your business prospects out of your hands. A well-informed business plan is simply non-negotiable for genuinely ambitious startups. Your plan can be lightweight, or a Lean Plan, so that it’s actually useful—not a document that you create and then never touch again—but it should include a market analysis, a S.W.O.T analysis, and financials that will help you meet clearly defined objectives. The point is to use your Lean Plan to guide your marketing plan and to make changes to both as you test and evaluate your strategies. While there are products with a wide appeal, most will resonate with a particular group of consumers. Some of the biggest and most successful brands today don’t target a mass market, but instead, they have a primary target group that they have come to understand and connect with at a deeper level. Every budding entrepreneur also needs to work with this principle, starting with a core target market and then slowly expanding their market base as the business grows and gains brand value and equity. Consider doing a formal market analysis to help you zero in on your model buyer personality, analyze the demographics they belong to and understand their needs, wants, and lifestyle. After you understand your target market thoroughly, gear your marketing plan specifically toward that audience. For example, a product with a target base of mainly older people will need to be marketed differently than a product which prospective consumers are teenagers. Don’t skip out on demand validation. If your market research suggests that you should focus on a specific demographic, test your findings. Communicate with actual consumers in that market to find out whether they actually have a need for your product, and whether they’ll pay for it. Testing as you go is always an option—there can be a lot of benefits to launching and marketing an MVP (minimum viable product) first to validate your assumptions and prove that a full-scale launch and marketing campaign is viable. After you have scrutinized and determined your target consumers, you’ll need to y devise a strategy to make it highly desirable to the prospective buyers. This starts with a deep understanding of your product and where it’s positioned in the market. This will involve developing a systematic marketing strategy called the SWOT analysis. SWOT stands for strengths, weaknesses, opportunities, and threats. Fundamentally, it is collectively the processes of research, analysis, and recording of business and market factors which may aid or hinder the successful marketing of your product or service or its market penetration powers. It’s slightly different from (but related to) the market analysis. If you do your market analysis first, your SWOT analysis should be a breeze. A SWOT analysis of a business offering is simple, really. Avoid inserting your opinions and gut feelings about your product when you look at its strengths and weaknesses. Be objective, and qualify your statements with facts and evidence. It isn’t a tool for convincing anyone that they should buy your product, so be honest with yourself. Being as objective as you will ensure that you will you be able to execute a marketing plan that emphasizes your strengths and downplays your weaknesses. Also, you’ll need to thoroughly identify your product’s opportunities and threats. This will help you make better and more informed business decisions that take advantages of favorable market conditions and help mitigate business threats. It is vital that you set and clearly spell out your business objectives at the outset. They will serve as a map to successfully guide you through crucial activities and stages of your business plan and growth cycle. Your objectives might change over time—that’s O.K. Document them though, so you can adjust your strategies to match. First, your objectives must be clear and concise, so that your employees or hired consultants can easily understand and execute tactics that will help you achieve milestone goals. If your objectives are too cumbersome, then it’s best to rework them in order to make them as succinct as possible. One great way to do this is to share the objectives with your mentors, consultants, or employees. The brainstorming sessions that follow could be all you need to achieve greater clarity. A realistic and feasible objective entails that the entrepreneur possesses in their arsenal every tool needed to accomplish the set of tasks. It is always important to give a timeline for the achievement of an objective—a milestone. You’ll have to balance being time-obsessed with setting timelines and deadlines that are reasonable. Your marketing strategy as a startup owner should take into consideration the required tools, software, and techniques that your products or services more visible and ultimately more attractive to your target audience. The good news is that advanced digital technology and media have revolutionized and simplified effective marketing for today’s startups. There are now tons of amazing, fast, and highly efficient toolkits (both free and paid) for SEO and social media branding, consumer and business analytics, asset management, and automated marketing, such as Kissmetrics, Google Trends, Google Analytics, A/B testing, and DropBox that you should take advantage of and fully explore. However, this can often be a highly technical field that requires the skilled and experienced handling of a seasoned professional—and it’s possible that it will make all the difference between the eventual success or failure of your startup. When you find out that you are not hitting your preset goals, when continually acting on your laid down strategy becomes a Herculean task, when you are struggling for justification for your marketing budget, it is time to look outside. A contractor or an employee that has the right skills and experience can put you back on track. The importance of having an online presence cannot be emphasized enough. Regardless of the niche or uniqueness of your startup’s product and service, a website is one of the most cost-effective ways to widen your products reach to prospective buyers. You need to think about a hosting plan for your website. Here, web hosting providers like GoDaddy, 123 Reg, and Discount Domains come to mind. Having a professional website host is important because it allows you carry out your business with ease while the professional takes care of the technical bits. With website services like domain parking, DNS configuration, and email hosting, you can have a visually pleasing and highly functional website in no time. Creating a budget is difficult for many businesses. If it is not done properly, you could find yourself struggling with a shortage of funds, which is a sure killer of the marketing process—and I do not have to tell you what that does to startups. It might be helpful to hire a seek professional help to plan a proper budget for your marketing needs, which could prove a money-saving action in the long run when viewed in retrospect. Reach out to an accounting firm that is experienced in the provision of strategic advisory services to small business and they can help you understand your business numbers better. Your budgets will be more realistic when you have a comprehensive grasp of your finances. After you’ve built a marketing plan and established milestones, you’ll launch it. But the process isn’t complete. Set a deadline for yourself to look back at your efforts and analyze their return on investment. If your analysis and appraisal have a positive outcome, then you should give yourself a pat on the back and reinforce the working strategy. With a negative analysis and appraisal, however, you’ll need to review and hone your business and marketing plans. Again, especially for startups, don’t wait a year to assess your progress. Review it regularly, and make minor adjustments as you go, so that you don’t look back and regret a huge investment of time and money on the wrong strategy. You must continually reevaluate your strategy to meet your objectives and respond to changing market dynamics and business opportunities. Marketing is an essential tool for startups to generate sales and expand their clientele, and though it does not guarantee a company’s survival, it ensures that the startup is not drowned in the boisterous sea of market competition.